Olivia Gillespie in Art & Photography on 13 October, 2015. When arriving at the Musée D’Orsay on an extremely sunny day in July I was not daunted by the extremely long queue but instead was patient and excited to gain entry into one of Paris’s most celebrated and architecturally grand art galleries. Upon our eventual admission I was struck by the extremely beautiful architecture of the former Parisian train station both internally and externally. Illuminating the vast collection of nineteenth-century marble sculptures in the Central Nave of the D’Orsay is the celestial arched glass ceiling with its rococo-style gold gilt suspended clock; the perfect setting for possibly the finest collection of French modern art worlwide. The Central Nave displays a grand selection of nineteenth-century marble sculptures including that of Auguste Préault, Paul Dubois and Jean-Baptiste Carpeaux. However, I am ashamed to say that I quite surpassed this wonderful collection to make it straight to the D’Orsay’s world-famous collection of Vincent Van Gogh paintings. I was successful in my primary mission for visiting the D’Orsay on this specific occasion to view and contemplate, in all its glory, Van Gogh’s Bedroom in Arles (1889). The museum presented a range of Van Gogh’s pieces and to my pleasant surprise I encountered one of the artist’s most famous paintings, his Self-Portrait from September 1889. With a large amount of visitors encircled around it, it is apparent that this work was the focal point of the collection. Van Gogh’s enigmatic self-portrait stares straight out at the viewer through Van Gogh’s deep-set and penetrating azure eyes. The artist’s evidently troubled blue eyes are reflected in the almost hypnotic background of perpetually twisting and swirling azure blue brushstrokes, which exude expression and profound feeling. I found myself being drawn in by these mesmeric, oscillating lines and I began to formulate a real sense of the intense anxiety which haunted this incredibly under-appreciated artist, which is evident in his pronounced and care-worn frown and unrelenting gaze at the viewer. This incredible propensity to communicate his innermost thoughts and sentiments through a mere application of the brush is what makes Van Gogh one of the world’s most favoured portrait artists. Nevertheless, the only downside about this fabulous collection would appear to be that each of Van Gogh’s works are veiled with a thin layer of glass. Naturally, this is common practice nowadays for contemporary museums to employ this glass shielding. 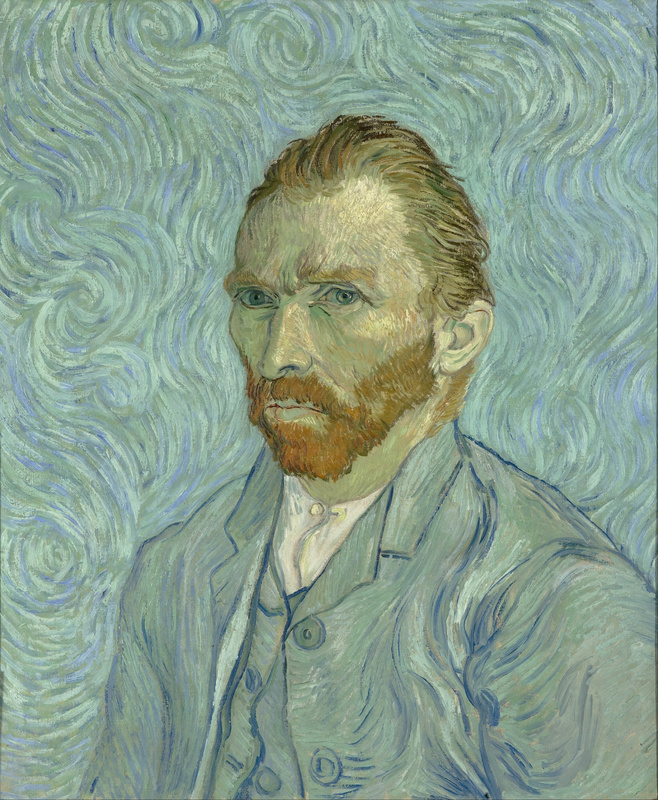 Although it is understandable that the Museum should take these precautions in order to preserve and protect these priceless paintings, I feel that it somewhat limits our viewing experience; most particularly in the case of Van Gogh, where we are unable to see, unobstructed, the artist’s characteristic impasto brushstrokes which are so deeply enriched with passion and raw emotion. After finally dragging myself away from this incredible selection of paintings, I was delighted to see the finest collection of Impressionist and Post-Impressionist art in the world. Suddenly I was in the presence of myriads of works by Cézanne, Degas, Manet, Monet and Morisot. 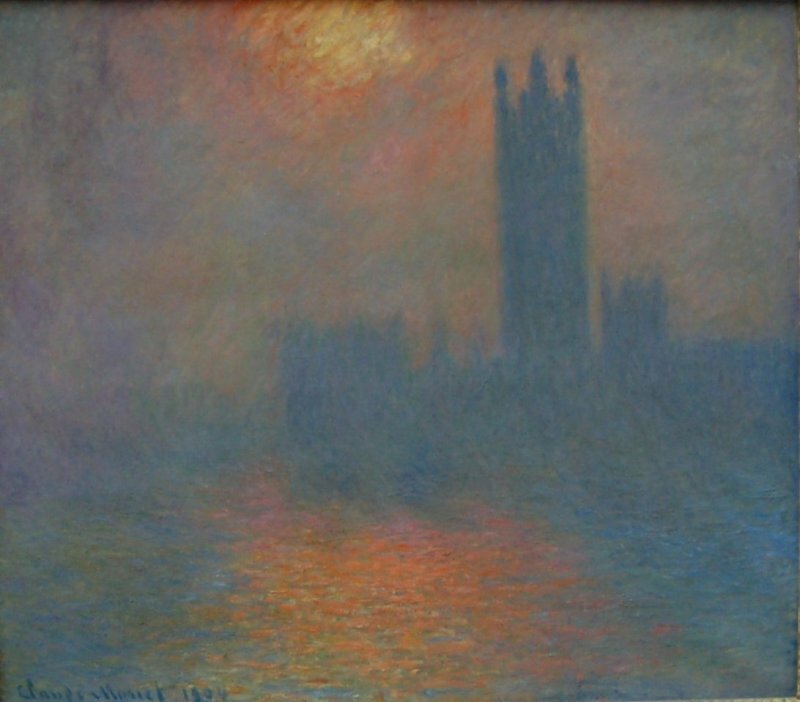 A particularly extraordinary work that I was instantly drawn to was Claude Monet’s London, Houses of Parliament. The Sun Shining through the Fog (1904). This oil-on-canvas struck me as quite out of character for Monet, who is known for his wispy and mellow depictions of waterlilies by daylight. In contrast to these later works, Monet’s portrayal of the Houses of Parliament appears to have a mystical quality which is evoked by the warm pink, lilac and golden yellow. This pastel palette is shrouded by the fog’s darker greys and blues yet is skilfully paired with the silhouette of the iconic London landmark to create a sense of familiarity that connects with the viewer, in particular the British viewer, to which I can whole-heartedly testify. While traversing the rooms of the Niveau Supérieur I was lucky enough to come face-to-face with the work of my favourite Impressionist painter, Berthe Morisot. Morisot’s painting Chasing Butterflies (1874) is typical of her unique approach to portraying women in her work. In this painting, the maternal figure in the foreground is covered head to toe in a simple white day dress with her face shaded significantly by her large black bonnet. The manner of obscuring the female figure and her face is Morisot’s way of contesting the sexualised image of the woman which was commonplace in the art world of her time. Features such as this are extremely evident in the works of Auguste Renoir and even Edouard Manet, Morisot’s brother-in-law, whose works include several portraits of beautiful and nubile young women. Like Van Gogh also, one finds that Morisot’s dashed, textured brushstrokes contribute to her obscuration of the female figure who is enjoying the simple delights of nature and outdoor life. If you’ve never been before, the Musée D’Orsay is a must-see the next time you visit Paris. Please don’t let the prospect of long queues put you off, because it really is worth it to see the treasure trove of European art within.